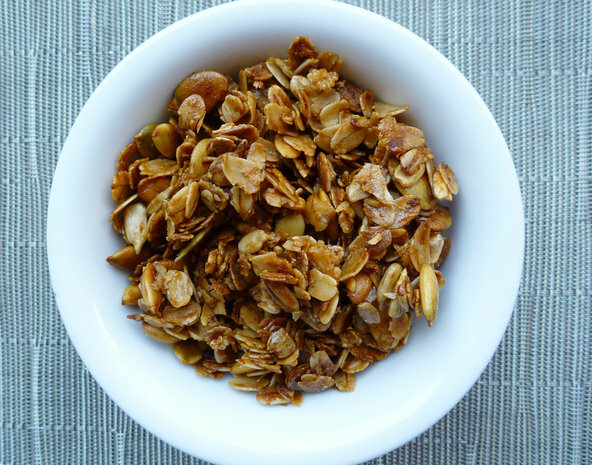 I try to eat healthy and incorporate a lot of whole grains into my diet which is why granola is one of my favorite snack foods. It's chewy, crunchy and sweet and does not taste like "health food" at all. I stumbled across this fabulous new recipe and would like to share it with everyone. It's pastry chef Robert Truitt's revamp of this classic staple. Preheat the oven to 300 degrees. Combine the oats, seeds, grains and salt in a large bowl. Heat the brown butter and honey and pour into the bowl. Mix well and spread evenly on two parchment-lined sheet pans. Bake for 10 to 15 minutes and toss. Repeat until the granola is a deep golden color, about 45 minutes. Allow to cool, break into pieces and store in an airtight container, preferably in a cool, dark place. Makes 2 to 3 quarts. there anyone else getting similar RSS issues? Anyone who knows the solution will you kindly respond?